Facebook is the harbinger of social media promotions. Followers can connect with friend circuits, keep these circuits alive and also plan promotions online. Plenty of new businesses are planning promotions through effective social media posts such as posting on the leading social media platform Facebook. 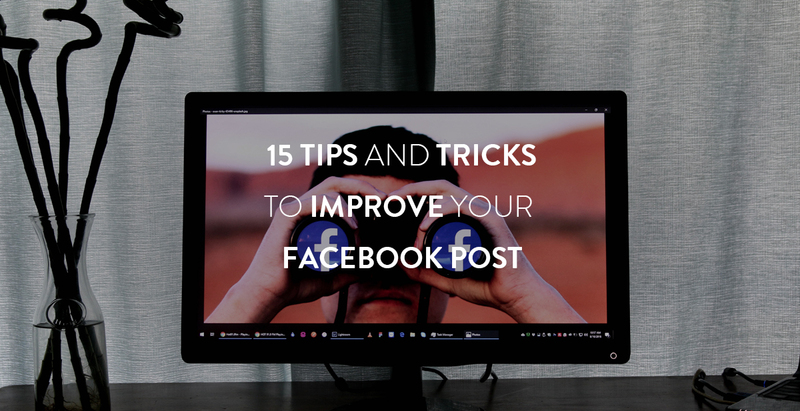 With some careful considerations, you can improve your Facebook posts. Your posts should be attractive. Do you want plenty of visitors to read your posts? The secret is to make it catchy and appealing for enticing the readers and capturing their attention. Use beautiful and captivating images using graphics and advanced tools. Your post should arrest the attention of the visitors. So remember to entice them and push them to read. Highlight the important aspects of your business and promote it easily. Provide all relevant information in a nutshell and present it well. This can increase the readability. If you are mentioning the features of a product or its utility, use bulleted points and list all the features. This will easily capture the attention of the visitors and they can find all the required information without searching. They need not read a huge description to understand the relevant information. Your visitors are busy, so provide them with the crux of your business in few words and satisfy their interests. This can effectively promote your business. The attention span of your readers is less than 8 seconds, so grab their attention with a striking picture of few keywords. Learn all about your audience using Audience Insights. Did you know that you could derive good insights about your audience? Find Audience Insights in Facebook’s Ad-Manager. Target your ads based on the understanding of your audience. This will help you target your posts well and create effective promotional content. Provide content that will settle the interests of your audience and inform them about your business products and services, its highlights. Build relationships with the visitors and convert them to readers. Elicit their interests in your post and transform them to be loyal visitors frequenting your Facebook pages. You can plan better promotions after you get plenty of regular visitors to your page. Your post may not contain too much content. But that requires much attention. You have to present all ideas with limited content. Plan intriguing content for your posts; include self-explanatory diagrams, representative charts, images and actual pictures. Use plenty of attractive fonts. Introduce contests in your Facebook posts. This will steadily increase the visitors to your page; plenty of visitors will become interested in your posts for participating in the contest and winning prizes. You can easily increase social media engagement. Business across the globe are introducing contests in their social media posts as part of their promotional campaigns. The contest strategy is tested and proven. With some efforts, you can improve the organic search for your posts. Remember to include direct links in your page. Publish photos and embed videos in your posts. Photos and videos can speak volumes that words cannot. There are few readers who will read a monologue about a product or service. Instead, provide good photographs of the products and videos on its features. You will be surprised at the Likes and comments you will receive for the post apart from the high numbers of visitors to your page. Play on the curiosity of the visitors… Use catchy phrases, captions and keywords. This will capture the attention of the visitors and convert them to readers. Use hashtags while posting on Facebook. It has more advantages over posting without Hashtags. You can use specific hashtags used for branding. For example, the brand Adidas uses the hashtag #teamadidas in their posts as it is a part of their branding. Do not forget to include a great cover photo for your business page. You can feature an 851 x 315-pixel cover photo at the top of your Facebook business page. There is no better way to capture the attention and interest of the visitors and inform them. They will be keen to explore the page and understand your business. Ensure that your Facebook posts are designed to improve the user experience. You may be under the impression that plenty of frequent posts can benefit your business well. But that is not the case. You have to present quality posts that will elicit the interests of the visitors and capture their attention. Choose relevant topics and reach out to the largest numbers of visitors. Be selective while publishing your posts. Devote your time to creating good quality posts and forget the numbers of the posts. There is no point of publishing low-quality posts as it will create a negative impression and lead visitors off your page. Images can speak volumes about your business. Visitors are eager to find explicit images to understand what the post is about. They may not be highly educated to read and understand long, detailed description. Visual content is interesting and most useful in engaging the visitors. The largest fraction of visitors is usually happy with good self-explanatory images in the Facebook posts. But ensure that your images are relevant and of high quality and resolution. Do not forget the importance of good visual content. You can freely include graphs, infographics, photos and images in your Facebook posts and increase its appeal henceforth. Format your images well according to the sizes and dimensions requirements of Facebook. This will improve the experience of the visitors. Videos are the favourites of Facebook visitors. They simply love all videos especially live videos embedded in posts. The numbers of the visitors led to posts with videos are high. They can save the efforts of reading text or analysing diagrams if there are videos to watch. It is a great way to engage the visitors and enable them to understand the relevance of your posts. You will realize the importance of videos if you find out the number of video views in your post. There are records of billion video views each day! Play the video and you will understand it in a few seconds. Did you know that 500 million viewers are watching videos on Facebook every day? Yes, it is true! Have understood how to increase the appeal of your Facebook posts are engaging your visitors. Try out our suggestions while planning posts in future. Content Writer | Google Certified Search Marketer |Hubspot Inbound Certified.